Mallett (Theoretical Physics/Univ. 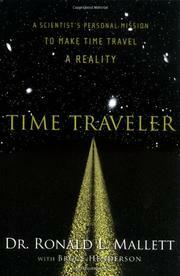 of Connecticut) chronicles his quest to build a time machine, sparked by grief over his father’s premature death, in 1955. The author was only ten, the oldest of four children in a happy, aspiring African-American family, when his father died of a heart attack at age 33. Two years later, that tragedy took on a different meaning for young Ronald when he read Classics Illustrated No. 133, a comic-book version of H.G. Wells’s science-fiction classic, The Time Machine. Mallett became determined to build his own time machine so that he could return to the days before May 22, 1955, and save his father. He pursued this quest despite bouts of depression that almost forced him to drop out of school. Early encounters with racism, especially while stationed in the South during his Air Force service, made him focus more intently on acquiring advanced math and computer skills. Back in the civilian world, he entered Penn State, majoring in physics. Mallett kept his long-time goal a close secret, knowing that it would be an impediment to any serious scientific career. But careful study of Einstein’s relativity theory convinced him that his dream was actually possible. The author interweaves the story of his scientific career with the drive to make his sci-fi dream of time travel come true. Eventually, he found that colleagues Stephen Hawking, Frank Tipler and Kip Thorne were investigating special circumstances in which time appeared to move backwards. Mallett began to explore the gravitational effects of a laser beam following a circular path. After complex calculations, he found his theory, an extrapolation of Einstein’s work, accepted by other physicists. Although his pipe dream of returning to save his father remains beyond reach, Mallett has achieved a significant scientific breakthrough. A hokey but inspiring blend of personal narrative and scientific exploration.